a real-world outdoor treasure hunting game. Players try to locate hidden containers, called geocaches, using GPS-enabled devices and then share their experiences online. First you'll need a GPS (global positioning system) device. Whilst you can buy dedicated units many of today's mobile phones have GPS built in so you might already have everything you need. Next, you need to locate some nearby caches. I put our NE43 post code into the search box at geocaching.com and was pleased to find that there are many sites nearby, the closest one to us being only about 200 yards from our front door! As this was our first attempt at this, I picked three caches that were rated 'easy' and which were no more than a mile from our house. I then typed the co-ordinates of the caches (available from the web site) into Google maps which showed the location of the cache on a map of the area. I then wrote down the clues from the caches' web site entries (cache creators tell you the general area and then expect you to work out the exact location from the clues they give) and off we went. We managed to find one of the three caches (the one nearest our house, as it turned out). Once the children found the cache they opened up the container and extracted its log book. The log book allows people who have found the cache to record their name and the date they found it. 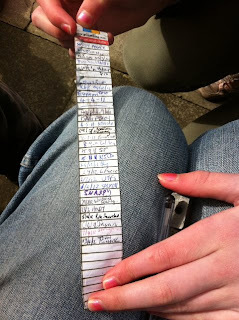 As this was a 'micro' cache (i.e., very small) its log book was a rolled-up piece of paper (see photo)! We duly recorded our find and replaced the cache in its location. Although we didn't find the other two caches, now that we have a better idea of how the game works, we will go back and find them soon. Geocaching is a great way to explore your local area as the caches can be very inventively hidden. Geocaching web sites (such as geocaching.com) require that all caches are graded for difficulty so you can make sure before you set out that you are not biting off more than you can chew. This is also an ideal family activity and is a really good way to get out and about with your children. If you have any comments on this, please feel free to leave your thoughts below. I'm definitely going to try some travel bugs. Just need the weather to improve.